This is a remake of the classic arcade game Spy Hunter in 3D. 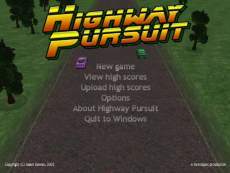 It puts players in control of a powerful sports car, in a world filled with enemy agents, seeking to take control of the road. Their mission is to destroy as many of these enemy agents as possible, without putting any civilian life at risk. Along the way, players will encounter varied terrain and weather conditions, a number of different enemy vehicles intent on their destruction, and also a few helpful pointers from their colleague, Ashley, back at HQ. The player's car is equipped with a front-mounted machine gun, which is their main weapon for use against enemy cars. It has unlimited ammunition, but they should be careful not to hit any civilian vehicles when firing. Their car is also capable of being upgraded with a number of add-on weapons. Additional weapons that are fitted will be displayed as a glowing icon at the bottom left of their screen. In the bottom right of the screen is a speedometer that displays how fast the car is currently moving. Immediately above this is a health display (a red heart icon). As the car sustains damage, its health will slowly deplete. When it runs out, the car explodes and the player loses a life. Health recharges very slowly over time as they drive along. A small health boost is also given for docking with any weapons van, and a larger boost for docking with the yellow and black repair van. These are not very common, but not as rare as the life van. Players should drive with care to avoid damaging their car. They should stay on the road at all times; straying onto the grass will cause severe damage to their (or any other) vehicle. This can be a useful way of dispatching enemy cars; however, ramming them off the edge of the road can cause extreme damage to their car if they are not careful. Players should beware of several types of enemy vehicles that will try to destroy them: Crasher tries to push you off the road, Blades will puncture your tires, Jeep is bulletproof, and Chopper will drop bombs on you or damage the road. Weapons vans are friendly vehicles that give players different types of assistance: Smoke screen weapon, oil slick weapon, surface-to-air missile weapons, repair or additional life.